Think of Scandinavian design and the words minimal, simple and natural might come to mind. Minimal and simple design and colour palettes. Natural materials and tones. 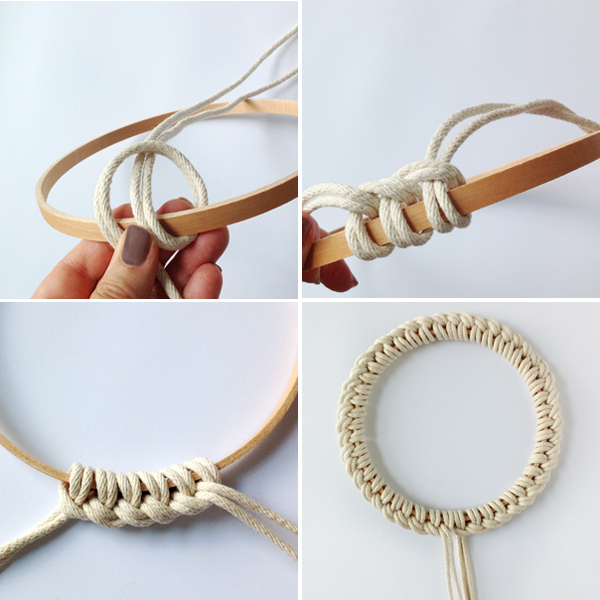 I designed this knotted macrame trivet tutorial with that Scandi design aesthetic in mind. I made two trivets which can be used individually, or they can nest inside one another. 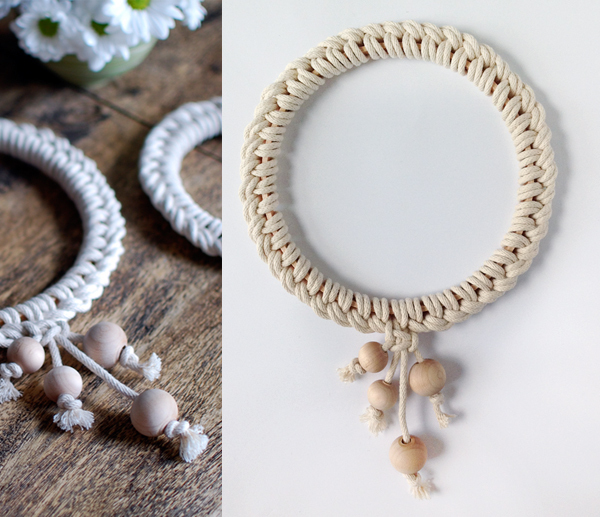 I only used two very simple macrame knots, so this is something easy that you can make for your home or for a gift. This fabulous vintage Scandinavian enamel saucepan is part of a set which belonged to my parents – it goes perfectly with my new trivets. You’ll need a wooden embroidery hoop (I used one 5 inch and one 7 inch hoop), some wooden beads, and cotton rope (mine is 4mm cotton sash cord). You may be surprised at the amount of rope you’ll need – I was! The 5 inch embroidery hoop has a circumference of 46 cm (18 inches) and I used 6.4 metres (21 feet) of rope. So the amount of rope I used is almost 14 x the circumference. 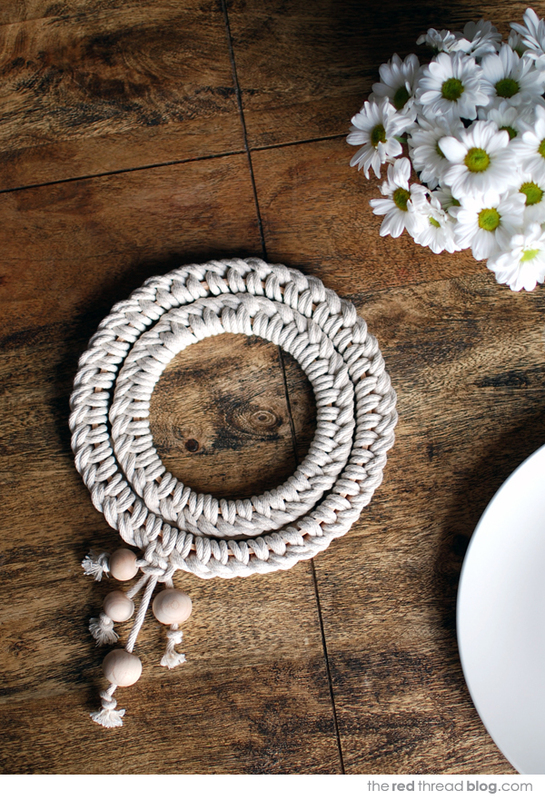 We will be working with two pieces of rope at the same time – for the 5 inch trivet that means two lengths measuring 320 cm each. Wind the bulk of the cord up to make it more manageable and secure it with a rubber band. First image below (top left): Leaving a tail of about 20 cm hold the rope and the hoop with one hand. Pass the rope over the hoop, down through the centre of the hoop, back up the front of the hoop and through the loop you just created. While still holding the rope in place with one hand tighten the knot, making sure the two lengths of rope are parallel to each other and don’t become twisted. Repeat this knot around the circumference of the hoop. So pass the rope back down through the centre of the hoop, underneath the hoop and back up the front. Then through the loop. Make sure the two ropes are parallel to each other and tighten the knot. Easy. To finish join the four tails together with a square knot. Straighten the four tails and lay them parallel to each other. First image below (top left): Take rope number 4, pass it over the two centre ropes and under rope 1. Second image below (top right): Take rope number 1, pass it under the two centre ropes and up through the loop created by rope 4. Pull the knot tight. Third image below (bottom left): Take rope number 1, pass it over the two centre ropes and under rope 4. Fourth image below (bottom right): Take rope number 4, pass it under the two centre ropes and up through the loop created by rope 1. Pull the knot tight. 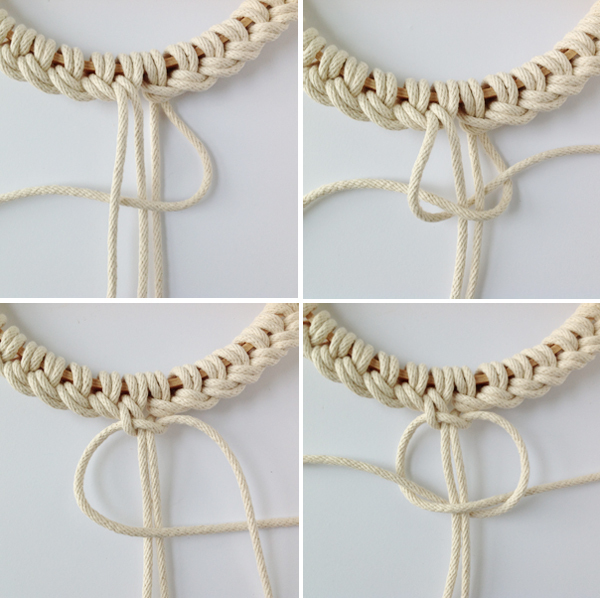 Add a bead to each of the four rope tails, and tie an overhand knot under the beads. Cut the extra length of the tails off so the beads are placed randomly. Fray the ends of the ropes. If you’d like the trivets to nest inside each other the smaller one should be made without beads. Simply trim the tails to about 10 cm (4 inches) long, tie a single knot and tuck the ends under the trivet. Secure them with a hot glue gun.